The tendency to the miniaturization of devices and the peculiar properties of the nanoparticles have raised the interest of the scientific community in nanoscience. In particular, those systems consisting of nanoparticles dispersed in fluids, known as nanofluids, have made it possible to overcome many technological and scientific challenges, as they show extraordinary properties. 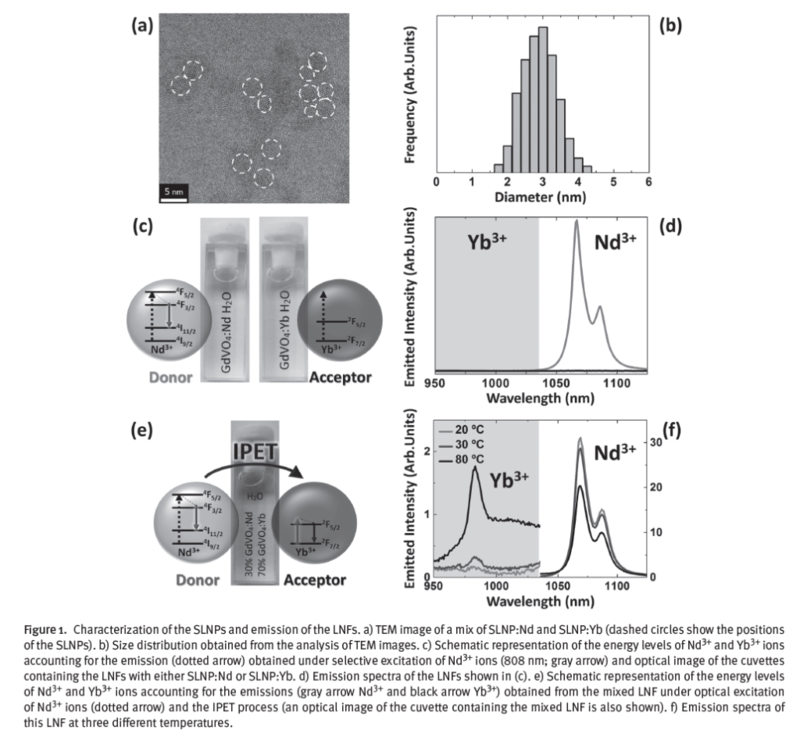 In this work, the loss of the spectral stability in heterogeneous luminescent nanofluids is studied revealing the critical role played by the exchange of ions between different nanoparticles. Such ion exchange is favored by changes in the molecular properties of the solvent, making heterogeneous luminescent nanofluids highly unstable against temperature changes. This work demonstrates how both temporal and thermal stabilities of heterogeneous luminescent nanofluids can be substantially improved by core–shell engineering. This simultaneously avoids the leakage of luminescent ions and the effects of the solvent molecular changes. Published in Particle & Particle Systems Characterization. a crossover existing in diverse water properties that occurs at about this temperature. 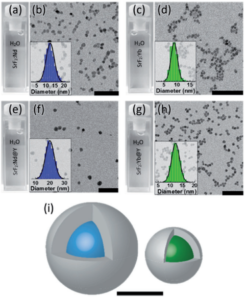 induce irreversible ion exchange between the interacting nanoparticles. Chlorine is a common undesirable impurity in synthetic SiO2 glass for ultraviolet optics and optical fibers. It is usually incorporated into glass as bound Si–Cl groups or interstitial Cl2molecules. We report a high-sensitivity detection of Cl2 in amorphous SiO2 (a-SiO2) by photoluminescence (PL) and also by Raman spectroscopy. The Cl2 PL emission band at 1.22 eV (1016 nm) appears at T < 160 K and shows a characteristic vibronic progression with separations ≈(520–540) cm–1 and an average lifetime of ≈5 ms at 13 K. Its excitation spectrum coincides with the shape of the 3.78 eV (328 nm) optical absorption band of Cl2 in a-SiO2, corresponding to the X → A 1Πu transition to repulsive excited state. Direct X → a singlet-to-triplet excitation was also observed at 2.33 eV (532 nm). Cl2 PL may serve as a sensitive and selective tool for monitoring Cl impurities and their reactions in a-SiO2. A Raman band of Cl2 is found at 546 cm–1. Cl2 photodissociation at energies up to 4.66 eV (266 nm) was not detected, pointing to a strong cage effect in a-SiO2 matrix. However, 7.9 eV (157 nm) photolysis of interstitial O2molecules gives rise to a Raman band at 954 cm–1, indicating a formation of dichlorine monoxide isomer, ClClO molecule by reaction of O atoms with interstitial Cl2. and Ce3+, Mg2+ co-doped Gd3(Ga,Al)5O12 (GAGG) single crystals of similar composition are investigated in the 9-500 K temperature range. The Ce3+ – related luminescence spectra and the photoluminescence decay kinetics in these crystals are found to be similar. Under photoexcitation in the Ce3+ – and Gd3+ – related absorption bands, no prominent rise of the photoluminescence intensity in time is observed neither in GAGG:Ce,Mg nor in GAGG:Ce crystals. The afterglow is strongly reduced in GAGG:Ce,Mg as compared to GAGG:Ce, and the afterglow decay kinetics is much faster. 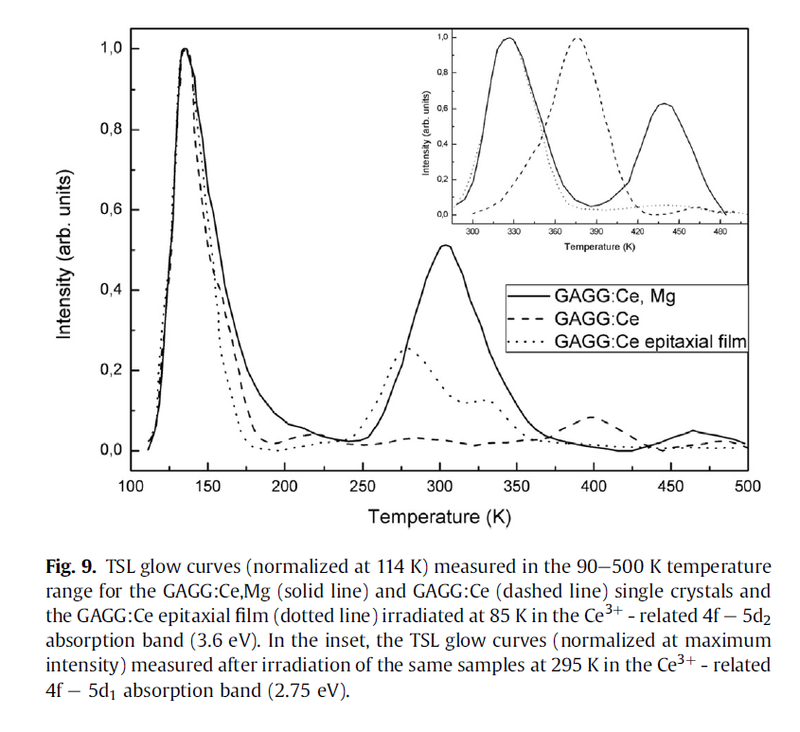 Co-doping with Mg2+ results in a drastic decrease of the thermally stimulated luminescence (TSL) intensity in the whole investigated temperature range and in the appearance of a new complex Mg2+ – related TSL glow curve peak around 285 K. After irradiation in the Ce3+ – related 3.6 eV absorption band, the TSL intensity in GAGG:Ce,Mg is found to be comparable with that in the GAGG:Ce epitaxial film of similar composition. The Mg2+ – induced changes in the concentration, origin and structure of the crystal lattice defects and their influence on the scintillation characteristics of GAGG:Ce,Mg are discussed. made to absorb volatile organic compounds (VOCs). 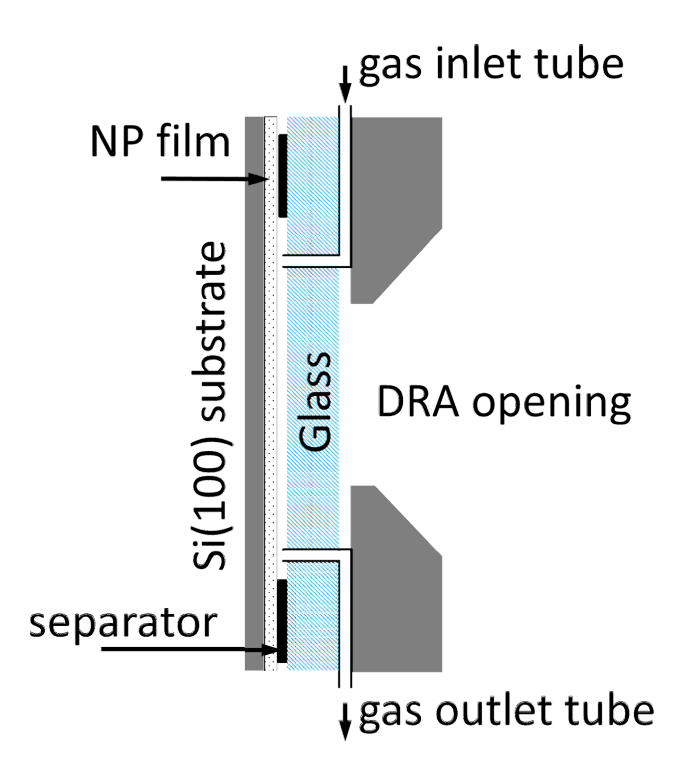 Since the color of the sensing element depends on the interference of reflected light from the surface of the film and from the film/silicon substrate interface, colorimetric detection is possible by the varying thickness of the NP-based film. Indeed, VOC absorption causes significant swelling of the film. Thus, the optical path length is increased, interference wavelengths are shifted and the refractive index of the film is decreased. This causes a change of color of the sensor element visible by the naked eye. The color response is rapid and changes reversibly within seconds of exposure. The sensing element is extremely simple and cheap, and can be fabricated by common coating processes. Beilstein J. Nanotechnol. 2017, 8, 229–236. A long lasting (afterglowing) luminescent material SrAl2O4: Eu2+, Dy3+ was prepared by high temperature solid-state reaction method. 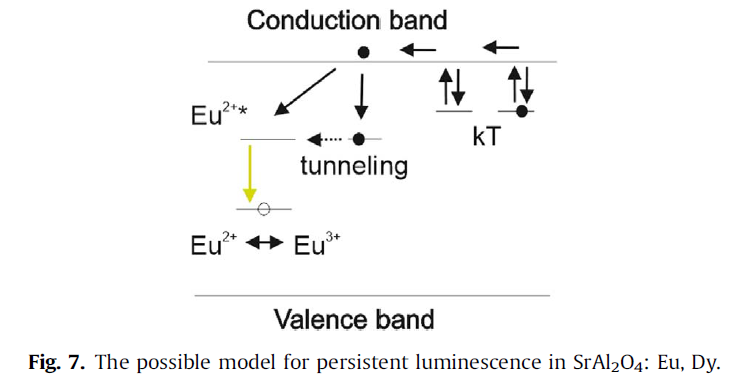 The processes responsible for long lasting luminescence were studied by means of luminescence spectra, thermally stimulated luminescence and afterglow kinetics.Two processes are found to contribute in excited Eu2+ creation – the thermally released electrons recombination and electron tunneling from trap to Eu3+. The possible scheme of long lasting luminescence mechanism is proposed.